I've recently become a Carson Dellosa Brand Ambassador....how fun is that? Carson Dellosa sends me products to use in my classroom and then I get to review them. 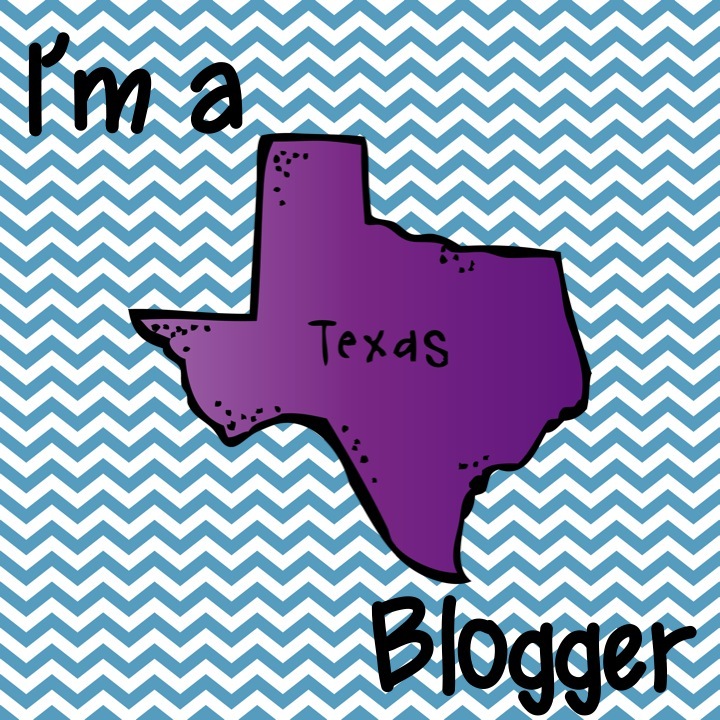 I love learning about new resources to use with my Fabulous 4th Grade Froggies! 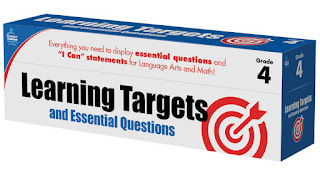 The two new product I used this month were the Learning Targets and Essential Questions and one of many Spectrum Focused Practice workbooks. I bet you can guess what book I chose.... that's right, I chose Writing! Wouldn't any 4th grade teacher? This books takes the students through the entire writing process with a lot of lessons in between and even reinforces language art/grammar skills. 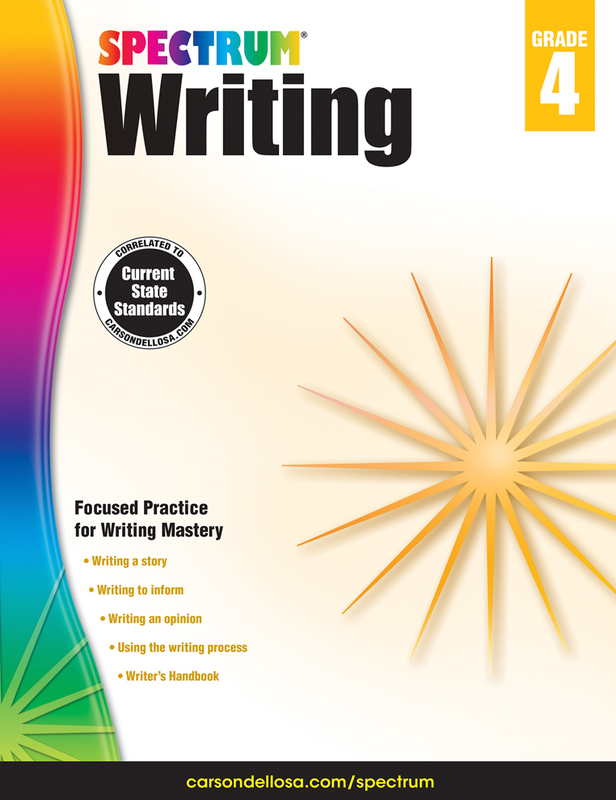 I love that this books covers many types of writing and well as writing for a purpose. However, my favorite part of this book is that it is so user friendly! I look forward to checking out the Spectrum series in other subjects. Watch this short video so you can see how great this series is for yourself! The Learning Targets are great too! We are required to post an essential question for each subject we teach. It can be written on the board or written/typed on a sentence strip and put in a pocket chart but it has to be posted somewhere so everyone can see it, especially the students. I like to say that every single student is able to answer the essential questions posted after I have taught the content. Not completely true but I can say that they all know what the essential questions are and that our goal is to be able to answer them. One of side of the card there is an "I can" statement and on the other is an essential question. I have only used the essential question side but I wish I had set for every subject and every standard we teach here in Texas. The cards are a perfect size to post and not take too much room. I don't use a pocket chart but I post on my board with one small magnet. I love not having to write the questions on the board. It is so much easier to look in the box and pull out the card to post. The essential questions are very easy to read and plain enough not to clash with any decor. Can't have something that clashes with my frogs, right? The cards are housed in a sturdy box that even includes dividers. I love that these cards lead my class to such great discussion and encourage my students to think critically. But I am going to be honest, the best thing about these cards is they are such a time saver!!!! The only thing is dislike about these Learning Targets.... they don't come in Science and Social Studies! Watch this video to see how you can use these Learning Targets in your classroom. What great products, huh? And did you catch the adorable elephant border in Learning Target video? If my room wasn't all about frogs, I would have to get that border! Review Disclaimer: I participate in the Brand Ambassador Program for Carson-Dellosa and have received this product for free to review.